This photo story is dedicated to Patton of The 2nd Company Governors Horse Guard. Due to Connecticut state budget cuts the 2nd Co. Governors Horse Guard was ordered to reduce their herd in 2012. The horses removed from the Horse Guard property were taken to different locations to be cared for by individual Troopers. These Troopers are so dedicated to the care of these animals they are paying out of their own pocket in addition to the hundreds of hours they give as volunteers to the Horse Guard. The horses of the Horse Guard are rescue animals, and donated by private individuals. 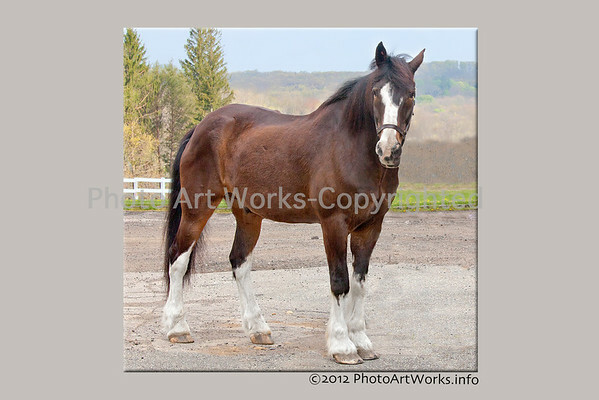 Patton, a Clydesdale X, who stood 17.3 hands high was one of the favorites. This gentle giant was always the lead horse in a parade when ridden by the Commandant of the 2nd Co. Governors Horse Guard, Major Gordon Johnson. These photos are from the day Patton left the only home he had known for most of his life to live with Trooper SGT Cotnoir-Abate who had recently moved to Vermont. As the photographer for the HG I have personally witnessed the loving care they give each and every animal. This was truly a sad day as the Troopers who were able came that day to say their good-byes to Patton. Due to age Patton passed away on December 14th, 2012, the same day as the Sandy Hook Elementary School shootings. When SGT Cotnoir-Abate sent out her email about his passing she said, "I feel that he knew the children needed him in heaven, I'm sure he gave many of them pony rides. I can just see him racing across an open field with a bunch of kids on his back squealing with delight." As children raced toward him in mass he never flinched, but would patiently gaze down at them as he was petted by many small hands. Patton will be missed, but never forgotten.